I recently watched a lovely friend receive deliverance from a very strong root of addiction. I was going back over the steps in my mind that brought her freedom. First she decided to pick up my book. She thought she was reading for a food addiction but as she read the pages and earnestly prayed the prayers, God showed her a stronger addiction that was the root of all of her other issues. Her next step was to journal about her painful history that led to her addiction. I believe this step caused her to release a lot of emotion and face her fear of revisiting some things that were painful. She then decided to draw a line in the sand with herself and began to resist her addiction, asking God to give her the strength. After just a few short days she began to testify about what God was doing in her life. As she testified one day at a prayer group, she was spontaneously delivered from her root of addiction (right in the middle of testifying) and was set free! [ Fear God, Not People ] “So don’t be afraid of those people, because everything that is ·hidden [concealed; covered up] will be ·shown [revealed; uncovered; disclosed]. Everything that is ·secret [hidden] will be made ·known [clear]. 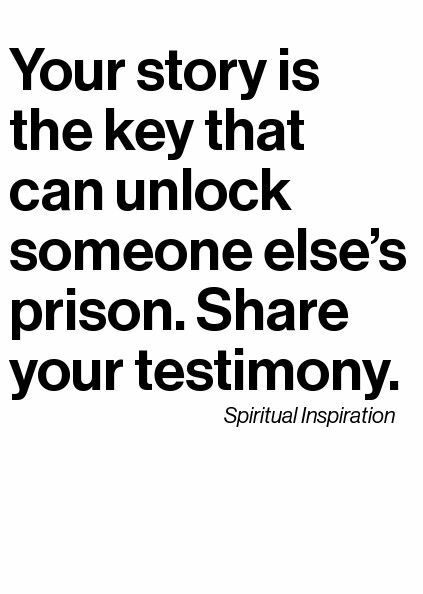 Testifying is an important aspect of being healed and like the beautiful quote above so eloquently states, others will get set free from your testimony as well! Acknowledge that there is a problem and find a tool (bible, book, counseling, etc) that will help you find the answers. Journal about the hard and painful things that God is calling you to release. Draw a line in the sand with yourself and begin to resist your flesh, asking God to be your strength. Begin to testify about what God is doing in your life and believe that He will deliver you completely! Take a moment to reflect on this today and ask yourself if you need to utilize these steps in your own life as a key to break through the hard places. 11 They defeated him by the blood of the Lamb and by their testimony; for they did not love their lives but laid them down for him. Have you utilized these steps for breakthrough before? I would love to hear your testimony!